“Carlin Superstar”. It’s one thing to think that in your own head about your own dog. It’s an entirely different thing when someone else says those words aloud. Particularly when they’re said by someone in a position to know. And yesterday, that’s what the judge said as Carlin and I walked out of the area of his third Exteriors Advanced search. 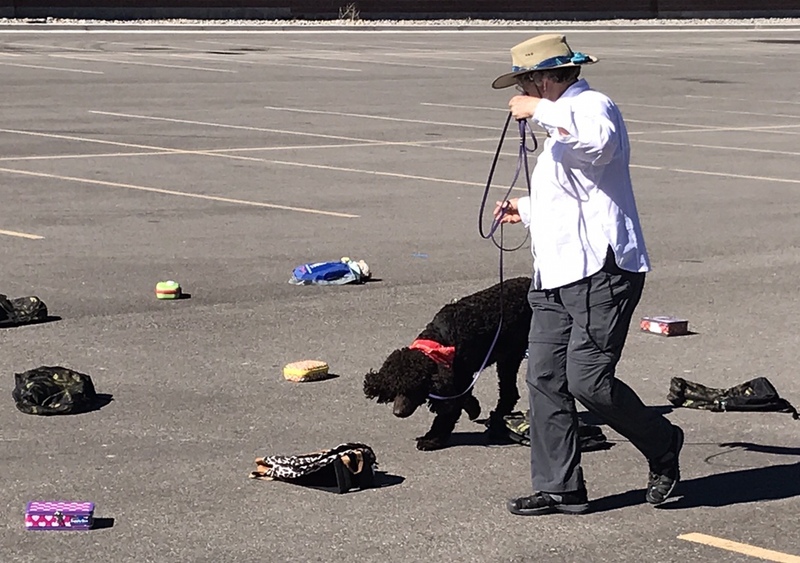 Exteriors Advanced had been a tough search for most of the dogs. Only two qualified, and Carlin was the fastest of the two with a time of 43:08 seconds and no faults. In Russ’s video, you can see from the movement of the spectators’ hair and the movement of the little pink flags that there was a definite breeze. I think the wind must have been swirling around the corners and into the alcove of the building. It was still morning, so not too hot, and the search area was still in the shade. We were the 5th team to run, so the odor had been in place for at least 1/2 hour if not longer. And the course was set up so that the start line was downwind of both hides, which I think helped. You can also see from the video how eager he is to go. Carlin is always eager to go. 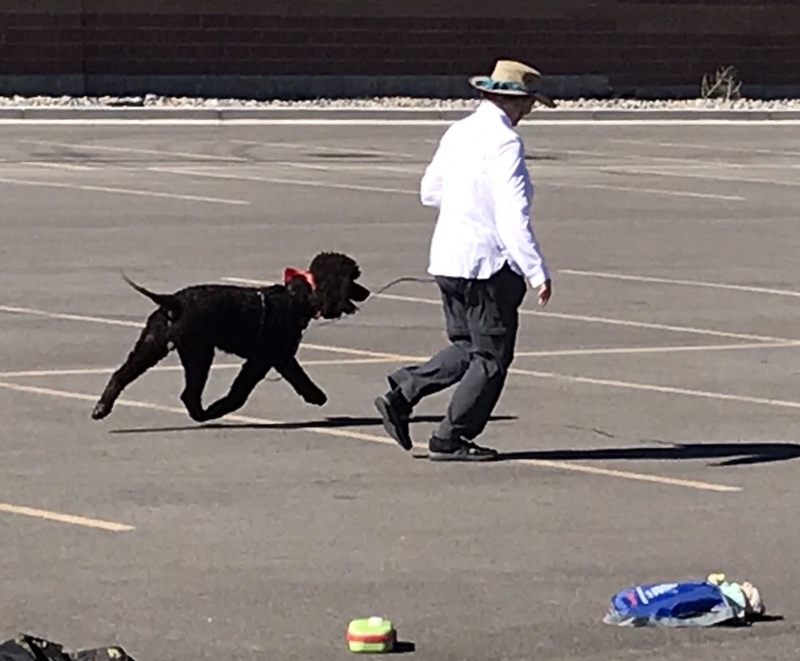 Even on the last run of the last day of a multi-day trial, he pulls me to the start line. He loves this game, just about as much as he loves Spaniel Hunting Tests. Russ also took a video of Carlin’s second Containers Advanced run. This search took place about an hour and a half after the Exteriors search. The air was warmer, the asphalt was warm but not too hot, and the breeze was still blowing. This start line was set at 90 degrees to the wind direction. I’d hoped to start Carlin on the most downwind row of containers (the row opposite the judge), but he had his own ideas. And as it turned out, that worked out great. The timer clocked him at 35:07 second, again with no faults, for another 1st place. 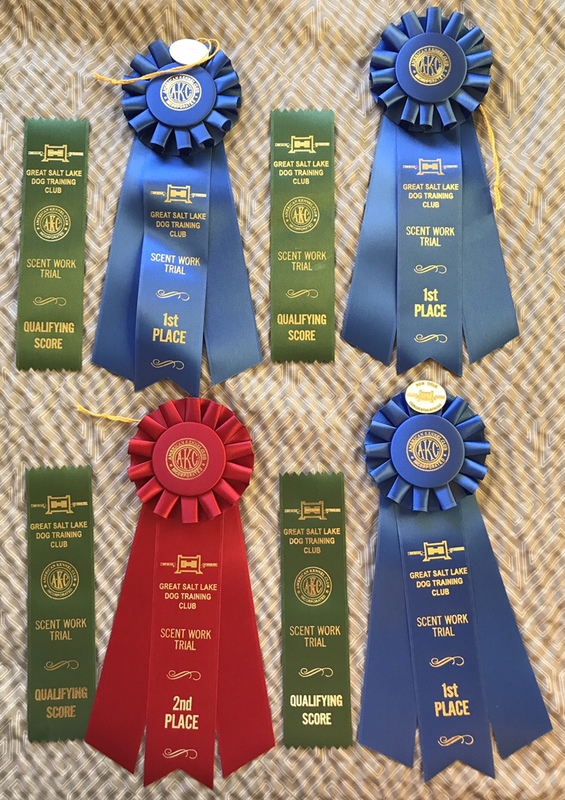 This run, being the third in which he qualified, also earned him his Scent Work Exteriors Advanced title. 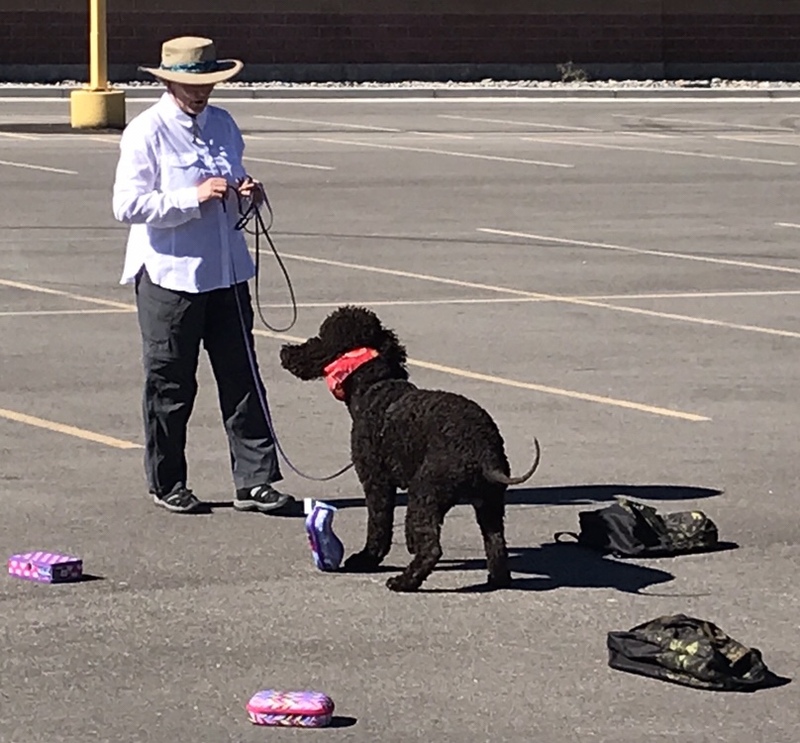 The Great Salt Lake Dog Training Club offered only Exteriors and Containers at the Advanced level in their trials this weekend, so since we were there anyway, I took Carlin out for another Exteriors run. Unfortunately, the battery on Russ’s camera gave out, so I don’t have a video of that one. But Carlin did well again, at 1 minute, 05:19 seconds for a 2nd place. That one took a little longer, I think, because there was this big round pillar that captured the scent of one hide and gave him the idea that there were actually two hides along the brick wall that formed the boundary of the second search. It took a while for me to decide that he’d found that hide already, and take him to the other side of the course along the downwind edge. He caught that scent as soon as we got downwind, and alerted to it right away. Our last run of the day was his third Containers Advanced run. Same three-rows-of-five setup, similar location in the parking lot, and what looked to me like the exact same containers. (I think they must have had several copies of the same containers, some “hot” with scent and some not.) This time the start line was set up at the corner of the search area, directly downwind. 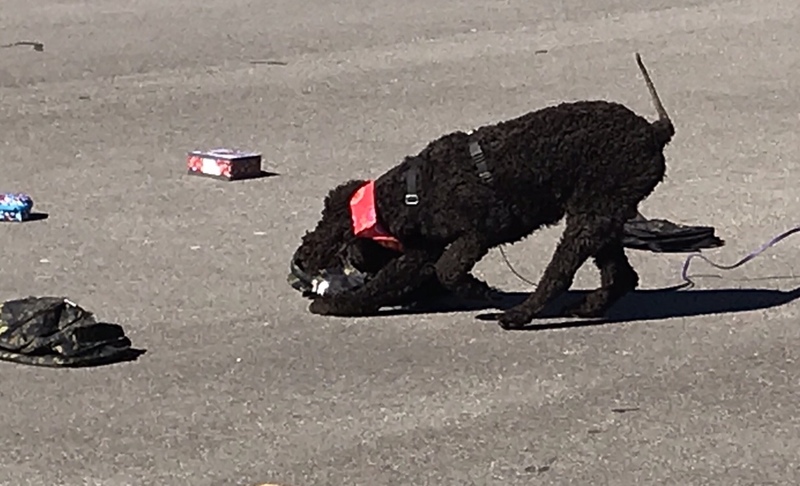 He finished this search in 34:09 seconds, for a 1st place and his Scent Work Containers Advanced title.